Bob Scott’s Bothy sits at NO 042 932 on a secluded and idyllic flat by the Lui Burn, a stone and wooden building which, along with Corrour, is probably the most frequented bothy in the Cairngorms. That doesn’t mean you won’t get in – I’ve spent many a night there all on my own, even at a weekend – but you shouldn’t plan on having it to yourself. The bothy is stone clad up to about a metre and wooden above, with a tin roof, but top class insulation and a good stove means it’s easy to heat and to keep warm. This is aided by the door opening not straight into the bothy but to a small entrance passage. The stove is multi-fuel but, as the estate does not like people to burn wood (live or fallen – it’s a habitat for insects, which are food for birds), if you want heat it’s best to carry in a small amount of coal. Five kg each isn’t a lot to carry (the bothy is only 40 minutes from the road) and if there are two or three of you that will easily see you through a weekend. Inside there are chairs, tables (of formidable construction!) and a sleeping platform. A dozen folk can sleep there perfectly comfortably, although I have seen well over 20 crammed in on occasion. The water from the nearby Lui Burn is perfectly potable. There is a septic tank toilet just beside the bothy. Flush with a bucket of water and put nothing other than human waste and toilet paper down the hole – wet wipes etc do not break down in the tank and can cause blockages which may result in the toilet being unavailable for several weeks at a time. Vodaphone signal is available in the area of the bothy – best reception halfway between the bothy and the burn. You can also pick up a signal if you leave your phone on the windowsill just inside the door. The bothy is properly Bob Scott’s Bothy Mk 3, for this is its third incarnation. The original was on the other side of the Lui and further upstream, at Luibeg Cottage. 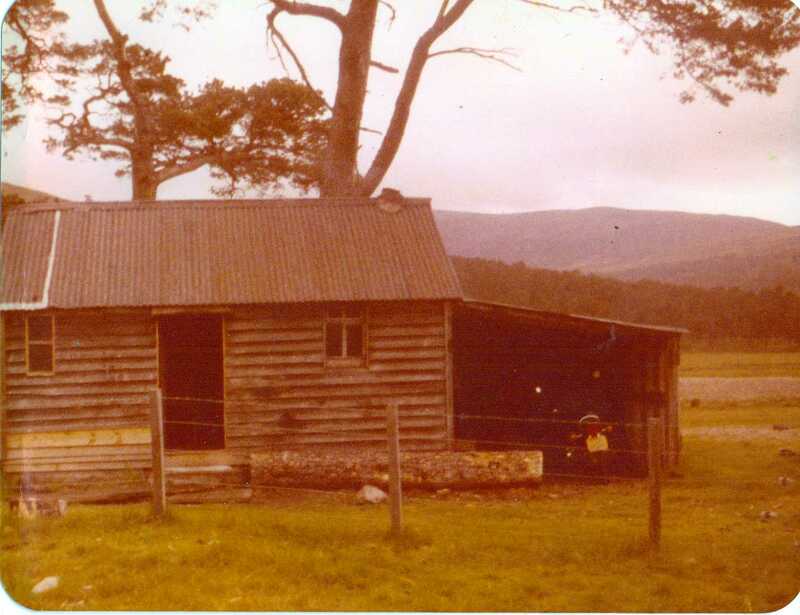 An uninsulated wooden structure with an open fire, it was used by walkers and climbers in the 1940s, with the permission of the then keeper at Luibeg, a Mr Beattie. However, in 1947 Bob Scott (see separate page) took over the Derry beat and moved into the cottage. It was he whose name became inextricably linked with the bothy. Bob was a good friend to climbers in the area and counted among his friends Adam Watson (the eminent ecologist and author of the SMC District Guide to the Cairngorms) and Tom Patey (the legendary climber whose ‘Cairngorm Commentary’ – to be found in the classic ‘One Man’s Mountains’ – gives a vivid account of the bothy during the ‘50s). Other regulars at Bob’s bothy during this 1950s golden age of Cairngorm climbing included Mac Smith (author of the first climbing guide to the Cairngorms), Bill Brooker and others such as Freddie Malcolm, Alan Will and George Adams, who were pioneering many of the now classic Cairngorm routes. 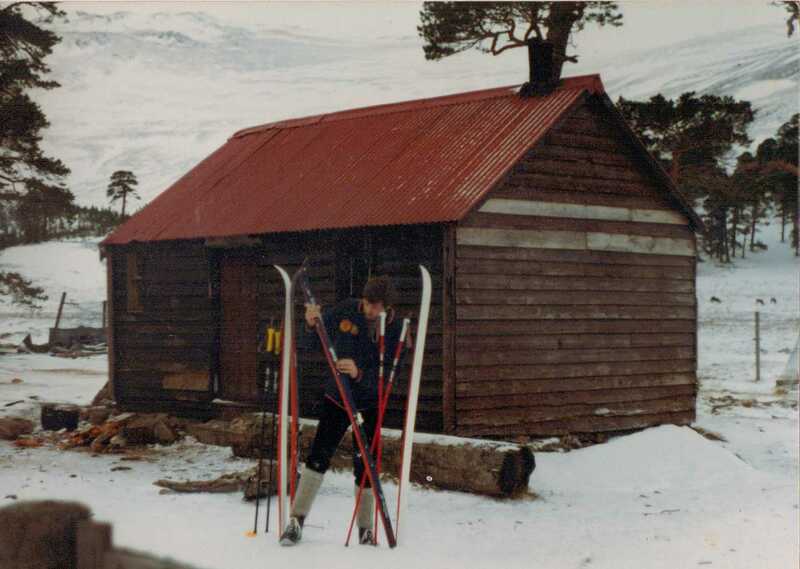 Luibeg Bothy in 1980. Note the motorbike driven up and ‘garaged’ in the shed. Through the ‘60s and into the ‘70s Scott’s remained a central part of the Aberdeen and Cairngorm climbing scheme, even after a public bar opened at Mar Lodge in 1964: the increasingly popular Canadian Campsite where the Lui joins the Dee was temptingly close to the bar, but meant a longer walk to and from the cliffs and higher hills. However a big change came when Bob Scott retired in 1973, moving away from his home at Luibeg and down to a cottage near the mouth of the Quoich. For a time a new keeper moved into the cottage, but he seemed to have little time for the climbers and walkers who frequented the bothy next door. Ian Shand, who donated these photos of Luibeg Bothy. It may have been 1978 but that’s still no excuse for that moustache! The Winers, Diners & Climbers came into being, a loosely formed group who looked after the bothy and carried out maintenance to ensure the estate had no excuse to close it down. Things went okay for more than a decade but on March 19, 1986, the bothy was destroyed by fire, in what has been described as “circumstances which never became public”. It could have been the end but over the years this small wooden shack had earned a huge amount of affection and loyalty from generations of users. A new organisation – The Friends of Bob Scott’s’ – was formed from WDC members and others and during 1986 they managed to convince the estate that the bothy could and should be rebuilt. Recognising the traditional use of the bothy, Swiss owner Gerald Panchaud agreed to allow the climbers to build a new bothy, stipulating that planning permission had to be obtained, along with approval from the Nature Conservancy Council, and that a toilet had to be provided. The bothy also had to be on a different location and, after considering several options, the FoBS agreed on the present site on the banks of the Lui downstream from Derry Lodge. A substantial fundraising campaign was launched and enough cash for materials was raised through this and donations from the Scottish Mountaineering Trust, the North East Mountain Trust and private individuals. Construction took place during the autumn and the new bothy was officially opened on November 8 1986. 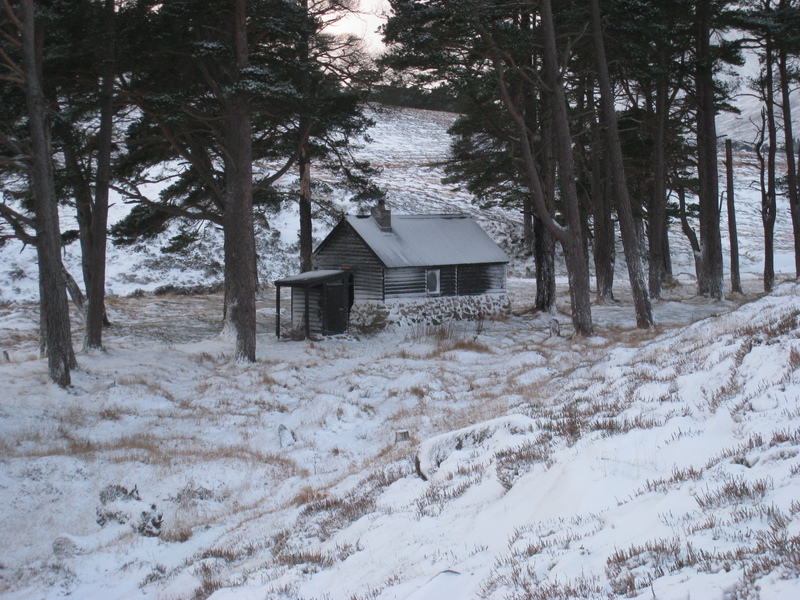 For the next 18 years the bothy was well looked after until December 16, 2003, when two regular users left the fire unattended while they went out for more wood. When they returned the bothy – and their own gear – was well alight and burnt to the ground. In 2015 bureaucracy finally caught up with the bothy. 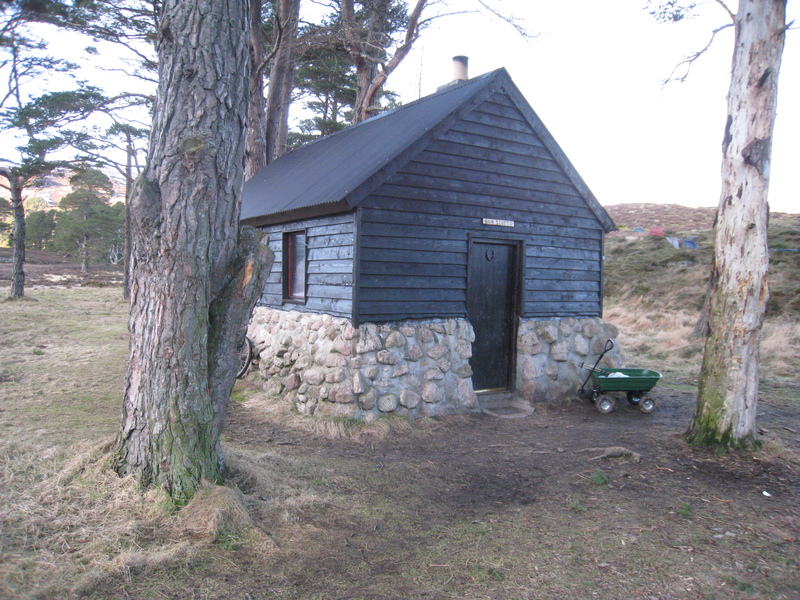 The most active of the Friends of Bob Scott’s had been asked to a meeting at Mar Lodge and were told an audit by owners the National Trust for Scotland showed there was no ‘paperwork’ for the bothy (the likes of Corrour and Hutchison are leased to the MBA). This, it seemed had to change. Mar Lodge Estate management were happy with the way the bothy was being run by FoBS, but insisted the situation had to be formalised. The end result was the creation of Bob Scott’s Bothy Association, a Scottish Charitably Instituted Organisation – SCIO Charity number SC045845. This allowed a lease to be signed and the necessary civil liability insurance to be obtained. 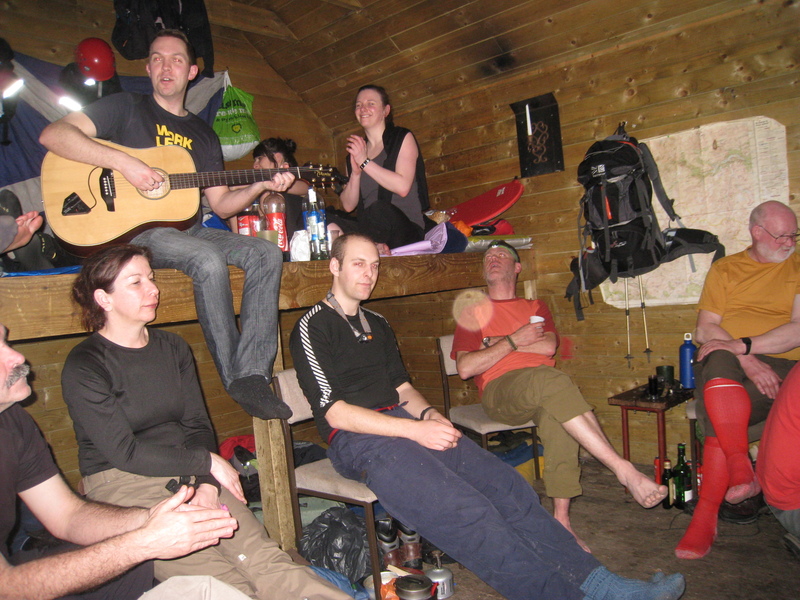 For users there is no change – the bothy remains open to all as ever it was – but the lease gives some security for the bothy and the insurance gives some security to the trustees. It does, however, mean that funds have to be raised every year to pay the not insubstantial costs of insurance as well as routine maintenance. The Trustees of Bob Scott’s Bothy Association are Neil Findlay, Kenny Freeman, Derek Stewart, John Gifford, Neil Reid, Ian Shand and Kenny Ferguson. Bob Scott’s Bothy Mark 3 remains as popular as ever, with a generation of walkers and climbers many of whom know little of the pivotal role it played in the climbing history of the Cairngorms – or indeed of the pivotal role it still plays in bothy maintenance in the Cairngorms. One of the unforeseen results of the construction of Mark 3 was a general renaissance in the condition of bothies throughout the Cairngorms. The core of people involved in the reconstruction went on to work on other bothies under the umbrella of the MBA. In the years since 2005 a crew of regulars and others have carried out major refurbishment projects at Corrour, Hutchison, Fords of Avon, Faindouran, Tarf Hotel and more, with Scottie’s often acting as a meeting place for planning future ploys or a first stop on the way to a work party. After an 11 hour day surveying the new part of the Lavender Federation Trail near Eudunda in South Australia it was a pleasant surprise to read about Bob Scott’s Bothy. The 6th of Oct. represents our 50th wedding anniversary and my 50th year in Aus. Still have many fantastic memories of nights sitting by Bob’s fire and listening to his stories. Thanks again for all your volunteers who have been restoring history. Hi George, good to hear from you again – and happy anniversary! Alas, Bob is long gone and the bothy has moved a few hundred yards, but the fire is still there and the stories are still being told. Hi Neil, I have a picture somewhere of the original bothy the day after the burning. We chanced upon its embers the following morning. I also have 1 or 2 pics of the old bothy when still standing – I think. It would be great to see those – especially the pics of it still standing. Maybe get something onto the site? Can you scan and email? Hi Neil, I think the pics are down in Kirkcaldy at my mothers house. I will let you know. Likely to be down there 5/6 December. Maybe grab a beer, too. Sounds like a plan. Be good to catch up again. Neil I have a yellow tattered page 4 of a Press and Journal 20 Broad Street Aberdeen dated 26 Feb 1960, which has an article by J Y L Hay about the Aberdeen climbing scene. Also has photo of Alex Thom climbing In Corrie Etchachan and photo of Alan Wills and I brewing evening meal at Luibeg Bothy,another cooking a meal at the Shelter Stone. Your articles keep triggering wonderful memories of the Cairngorms. Sounds like a fascinating article, George. I’m glad the blog keeps bringing back memories. A few years ago one of the other Scottie’s regulars and I talked about how all this history and bothy culture will be lost if no one writes it down, so that’s what I’m trying to do here, as well as providing information. Any tales and memories to add to the melting pot are always welcome. The guy standing next to the touring skis is Wullie Mcgregor of Aberdeen . Many an evening I’ve sat on that log at the door with a cup of tea and a fag in my hand after a day on the hills. Once long after Bob Scott was no longer there, I was walking back through the woods at Derry and couldn’t figure out what was different. It suddenly struck me that the sound of Bob Scott’s generator was no longer pump, pump, pumping away. Neil, you mention a stove in the bothy. Is it suitable cooking on, does it have an oven? Thanks. Peter. You could heat something up on the top, but it’s just a plain woodstove for heating – no oven. Thanks, we hope to visit soon. I have just come across your site and am enjoying some of the articles, as they are bringing back memories of my hill walking days. I afraid they are all over now as I have moved to Ireland, however I always hope to write my mountain memoirs one day. 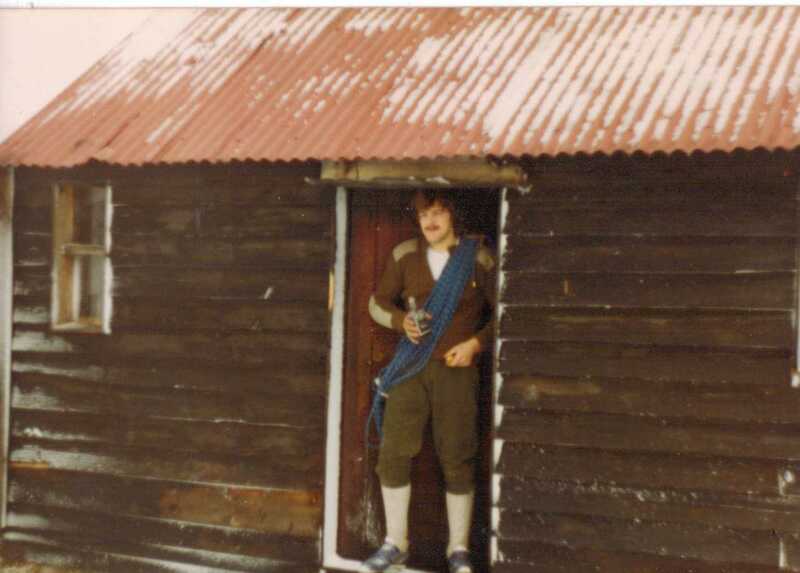 I spent many a week-end with fellow climbers in the area back in the late 60s and70s,Staying at ,Corrour, Etchachan and Bob Scott’s,We were all from the Bucksburn area in Aberdeen.CHARLES WALKER, EX CLOVER LEAF YODELLER. my friends and me spent a night camping outside Bob Scott’s on July 15th and met Neil Findlay with a volunteer crew repairing the floors of the bothy. Anyways, you and everyone else are doing a great job keeping the bothies up and running! Many thanks and I hope we’ll be back in Scotland soon! Glad you guys had such a good time, Gerrit – and Neil Findlay is a good friend, so I’ll certainly pass on your thanks. Great wee spot and certainly one of the prettiest bothies in Scotland with the fine Scots Pines. I asked my wife in waiting to be to marry me at the Derry confluence, and it is our plan to find a way of also getting married at Bob Scott’s in a wee informal gathering before heading down the road for a party. We had thought about spending the night as well but I think it would be too imposing on visitors to the Bothy. But they’ll be welcome to a dram when we are there. Hopefully I can pull it off. Be nice to see that work, Iain. Fingers crossed for you. Go for it! And have an extra dram for Bob, he was a great guy and very kind to me. Best wishes, Peter.